I’ve never been much of a coffee drinker – partly because the bitter taste did nothing for me and partly because it can lead to, how shall I put this, frequent trips to the ladies’ room. In the last few months though, I couldn’t help and feel that I am missing out on one of life’s simplest yet apparently most enjoyable pleasures. So I decided I was ready to give it another try and embark on my coffee discovery adventure. Now, let’s make it clear that when I speak of coffee I am not referring to the watered down North American version, a double-double or some fancy, concoction from Starbucks. I am talking about Turkish coffee. My earliest memories of coffee take me back to when I was barely three or four years old. On a daily basis, whether with guests or within the family, I witnessed people gathering and spending time together to enjoy this aromatic drink. There were jokes and laughter, tears, stories of my grandparents’ childhoods, stories of love and loss and everything in between. Growing up in Sarajevo, Bosnia and Herzegovina, a city and a region that are no strangers to external cultural influences (from Ottoman to Austro-Hungarian), my childhood, although short-lived, was filled with amazing exposure to the beauty of these cultures. Without getting too deep into a history lesson or any historical grievances, it’s important to know that the Ottomans (Turks) occupied this region for four centuries, leaving an undeniable cultural footprint, which permeated all areas of life from language and architecture to food and social customs. 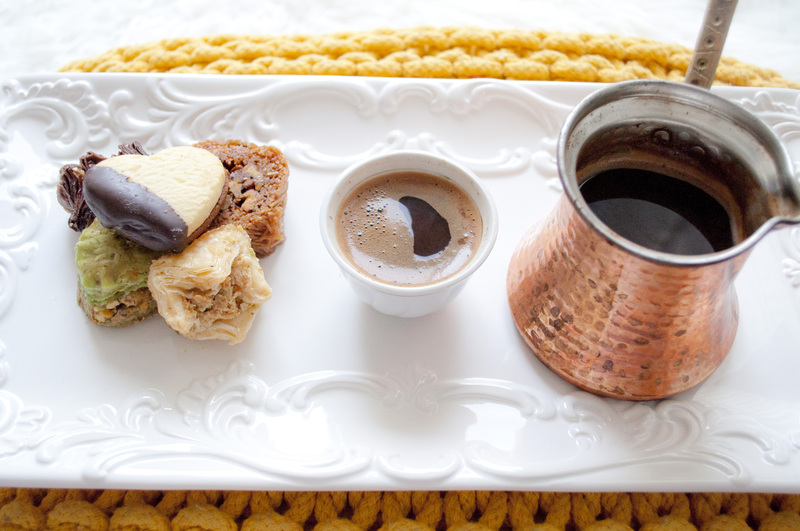 One of these is Turkish coffee, which by its method of preparation and consumption is meant to be a slow process. So if you are looking for java on the go, this is probably not for you. However, if you are interested in slowing down, taking a moment to stop and really treasure a moment in time over coffee, then you should give it a try. I mean, who doesn’t yearn for a calmer pace in this hyperactive world? After talking about my desire to give coffee another try, my parents surprised me by buying me a dzezva, Bosnian term for a copper pot used for cooking the coffee. These beautiful pots come in many different sizes and designs. In Sarajevo, local craftsmen design and make them on the spot in their shops. However, with the age of the Internet, mine comes from www.turkishcoffeeworld.com, as a trip to Sarajevo was a bit out of budget! When cooked the coffee is served in tiny cups called fildzan. When the water is heated, add two to three teaspoons of finely ground coffee (can be purchased at any food store or ethnic food stores such as Mrakovic Meat & Deli or Stari Grad here in Toronto). Authentic Turkish coffee usually has sugar in it, however, as some people prefer their coffee black you can omit this part or sugar to taste. Let coffee and sugar sit until the water soaks it and sugar begins to dissolve. At this point stir the coffee and sugar and drop heat to low. Pay attention to the coffee as it will start to rise, once it starts you can stir once or twice, until the froth rises to the top again. At this point you can either pour coffee directly into cups or scoop equal amounts of froth into each cup and then pour. As Turkish coffee is not filtered you should let the grinds settle for a few minutes before drinking. 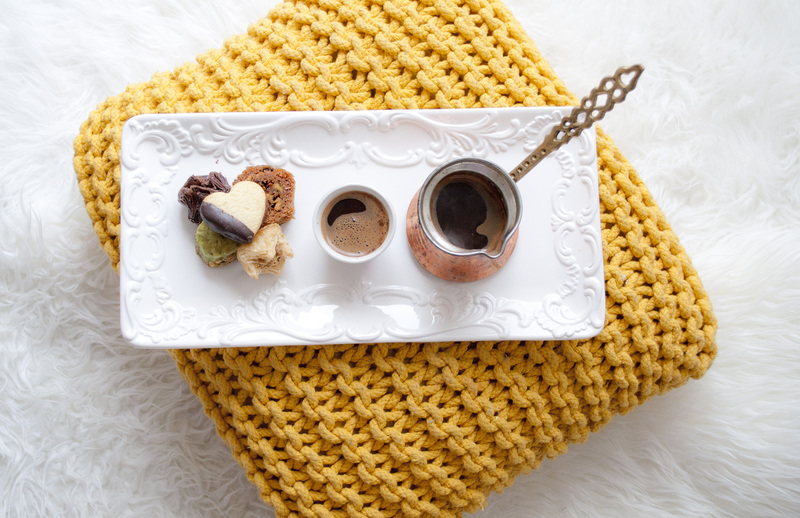 Traditionally, Turkish coffee is served with water to cleanse the palate before drinking, however, most Bosnians I know don’t really do that part. Not surprisingly, Bosnians prefer to start with rakija (plum brandy). 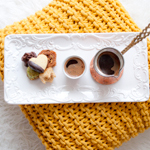 You can serve the coffee with sugar on the side as well as a delicious Turkish dessert we call rahat lokum or simply in English, “Turkish Delight”. Sometimes people opt for other Middle Eastern delicacies such as baklava. So, what did I think? Well, once I got over the strong taste I quite enjoyed the immediate powerful jolt of energy and alertness, which let’s be honest is something I am not going to say no with two little children who keep me awake nights and days.